I wrote ‘Bachiatari’. It means Cursed in English. 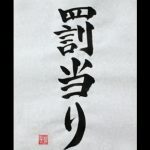 ‘Bachi’ means Judgment or Curse ‘Ata’ means Incur ‘Ri’ is Hiragana If someone do evil, god and Buddha will punish someone. ‘Bachiatari’ indicate doing evil and someone who do evil.